So, yeah, now you know the truth. 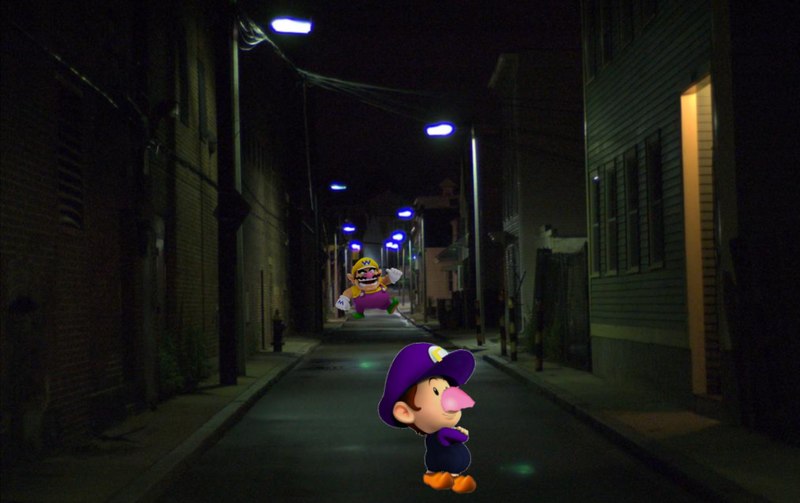 You know who Waluigi is... Or do you???? Talk about "character development", am I right? Sarcasm aside, I decided, out of pure curiosity about Waluigi, to take matters into my own hands. How? I was going to write a backstory for Waluigi. That's right, I was going to lift the veil from his crooked nose. I was going to take off his purple hat. People will now know who he truly is! Thank you very much for your kind thoughts. I barely ever get that now-WAH-days. Seeing as you seem to be a fan, I can let you in on a few secrets. We'll make a deal: You let me write posts on your blog, and I'll let you in on the truth, okay? You get more views, you and others will find out my backstory, and I'll get positive publicity. It's a win-win scenario! Maybe Sakurai will see it and put me into Smash Bros... But WAH-tever. That's just wishful thinking. Now, I'm handing the tale over to Waluigi himself, as we start chapter one of our wicked tale: His childhood. I don't remember my parents. In fact, my first memories were sitting in the orphanage. I was quite miserable there: The kids would make fun of me for my long nose and strange demeanor. It was impossible to stand their constant teasing and bullying for a single day; No matter what, the day would end in me whining in my pillow ("WAHHH, WAHHH") over an unthoughtful insult from another child. I dreamed of leaving the dreadful place. Of jumping through the window, sprouting winds, and soaring far away, where no one could ever bother me again. I tried escaping there a few times, but the headmistress, Miss Koopa, always ended up catching me and giving me a scolding. On my last attempt to escape, she finally decided to ask me why I kept doing it. 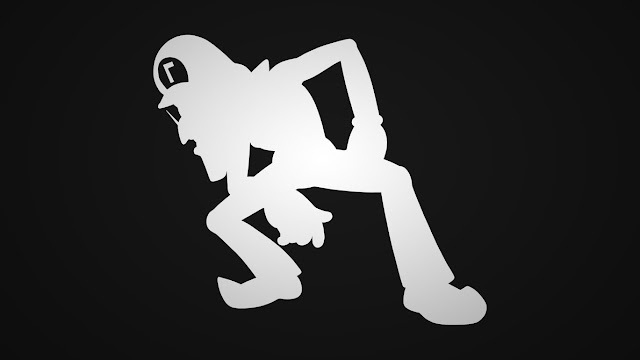 "Why do you always try to run away, Luigi?" Miss Koopa asked. I had no actual name; My parents had deserted me soon after birth, but most people ended up calling me Luigi due to a tendency I had to uncontrollably spit loogies at people. "Reggie an-and Doug keep c-calling me m-mean names and, made f-fun of my n-nose, and... WAHHH!!!" Stuttering, I burst into tears, whining with spit bursting out of the edges of my mouth. "Well, how about you try sticking up for yourself, Loogie---I mean, Luigi," she quickly fixed her mistake, shamefacedly. "Sticking up for myself," I muttered. I had never heard the phrase before. "Wahh--wha-wa-whats that?" "Oh, you know," she replied. "Show them that you aren't meat for them to chew on! Put a shield between their sword!" I nodded in understanding, and from that moment on, I was never the same again. You see, she had meant to give me good advice, but the way I interpreted it was much different than what she could have possibly imagined. I thought of it like this: If people give you a hard time, give them a hard time, too. So from then on, whenever Doug or Reggie would pick on me, they would probably wake up to find wet toilet paper under their pillow. Or a whoopie cushion under their seat. You know, good ol' trickery. Sigh... How I miss playing innocent pranks on people. Nowadays, it's all about the worse trickery; You know, throwing spikey shells at people and blowing up their go-karts! At first, nobody had a clue who was pulling these pranks on the boys. Eventually, though, Miss Koopa started connecting the dots about what was happening. Who had a big grudge on Doug and Reggie? Who had a bad temper and would give into it easily? Who was the most cunning and deceiving child of all? Of course, it had to be me (and Miss Koopa must regretted giving me that advice long ago)! So she gave me a terrible scolding. "Why would you do that? That isn't nice! This is unacceptable!" But all her complaints sounded as if they were "blah, blah, blah" to my ears, and I just ignored her. So when she told me to sit in the time out corner (which happened to be right next to the exit door), I pretended to happily agree. And just my luck, the moment I walked over, another child was asking for some water. "All right, Link, I'm coming!" she yelled back, distracted and not looking at me anymore. Here was my chance! I could dash out of this miserable, wrecked place! So I took the chance without much further thought, and I was met with a long dark alleyway in front of me. There were no cars here. It was all empty, lonely, and dark. The only sources of light were the few street lamps, flickering far above my short head. I instantly regretted my decision to run away. I was hungry and sad, and now no one could care for me! Not knowing what to do next, I collapsed onto the dirty concrete and sobbed. My misery seemed to stretch on for eternity. For minutes, hours, or maybe even days, I was crying in the dark, lonely alleyway. Until, one faithful moment, I heard something other than my loud and distinct "WAHHH". There were footsteps coming from somewhere behind me. I turned around out of a mixture of shock, curiosity, and hope. Who could it possibly be who was walking up to me in the middle of a deserted alleyway? Then something happened that would change my destiny forever. I heard deep, almost sympathetic laughter, and loud thuds of footsteps. I turned around to see a short, stout, possibly Italian man with a large bushy mustache. He, too, had a large and unusual nose. His eyes gave him an almost sinister look. My sobbing started to slow down. I just stared at him in confusion. "Hey, kid," he said, in a much more gentle tone than I was expecting. "It'll be all right. I'm the good guy, you see," he paused and chucked once again, "so I can help you. What's your name?" Still sobbing slightly, I told him, "WAHHH.... WAHHH.. WAHHH... Luigi." "Oh," he replied, grinning widely. "So you're a "Waluigi", huh? Want to come along with me? I can make your life a lot better, trust me." I was too miserable to even argue at that point, so I nodded yes. "All right then, little man," he said, hosting me up on his wide, chubby shoulders. "Get some rest. 'Cause we have a long journey coming up if you ever want to get away from this wreck."